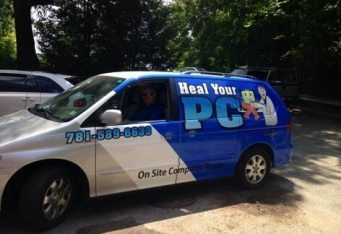 When we initially met Bob, who does our computer repairs, he asked us about redoing the wrap on his van. We explained our philosophy regarding wraps and shared our thought that his existing wrap was very busy, hard to read, and—in our opinion—not earning the most bang for his advertising buck. Successful wraps should be clear, and customers should be able to determine easily what the business is, what they do, and how to contact them. 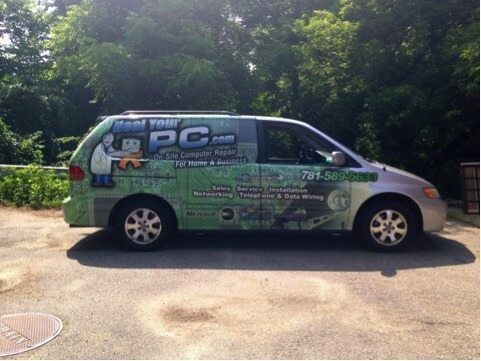 Bob wanted to keep his existing mascot, so we worked with it to redesign the wrap. 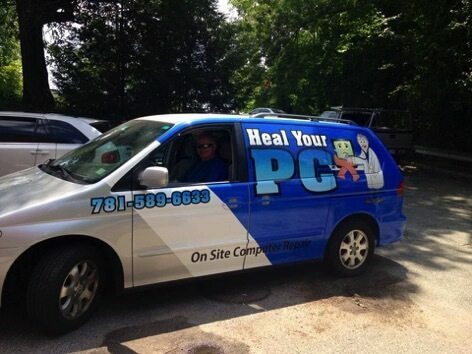 The first hour after he had picked up the van with the new and improved wrap, he was stopped in a parking lot for his business card! 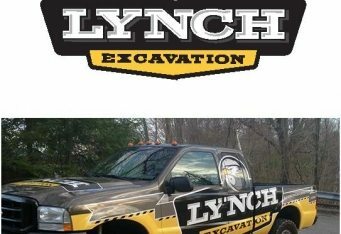 “Several months ago I approached one of my clients, Raychel of Lexington Signs and Graphics, about creating a new design for my commercial van. I am in the computer service business and the old one (5+ years) was looking dated and was never very clear or crisp to the public. Raychel sat down with me and went over five different drafts with various colors. She made it a point to emphasize what kind of theme I wanted to project for my business.